NEW YORK (F.A.S.T. 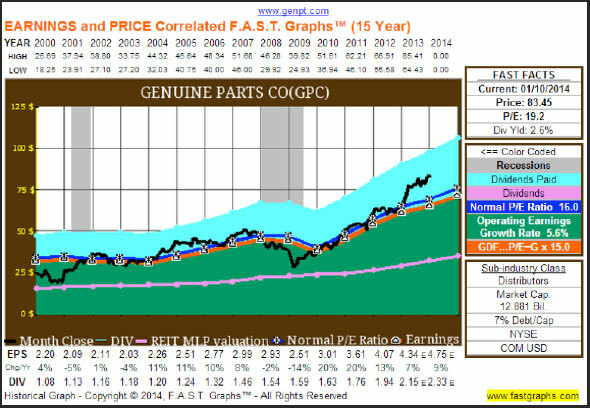 Graphs) -- Do you know Genuine Parts Company (GPC - Get Report)? Founded in 1928, it's in the business of distributing automotive, industrial, office and electrical parts. With a network of over 2,000 operations, Genuine Parts Company spans the geography of North America. On the automotive front, you would likely recognize Genuine Parts by its subsidy Napa, which distributes over 380,000 products in the U.S. alone. Within this segment -- which constitutes roughly half of its business -- Genuine Parts enjoys a massive scale advantage because it has a far greater amount of distribution centers than its competitors. With this benefit, Genuine Parts is able to provide parts at a quicker and more efficient pace. In addition, the company enjoys a bit of a moat from diversifying its business. The industrial, office and electrical components operate under the names Motion Industries, S.P. Richards and EIS, which collectively make up the other half of the business. These businesses operate under a similar model as the automotive segment and provide a range of market exposures. From this protected business model, Genuine Parts has put together an enviable track record. For instance, the company has not only paid but also increased its dividend for 57 straight years, the fifth longest such streak among businesses today. 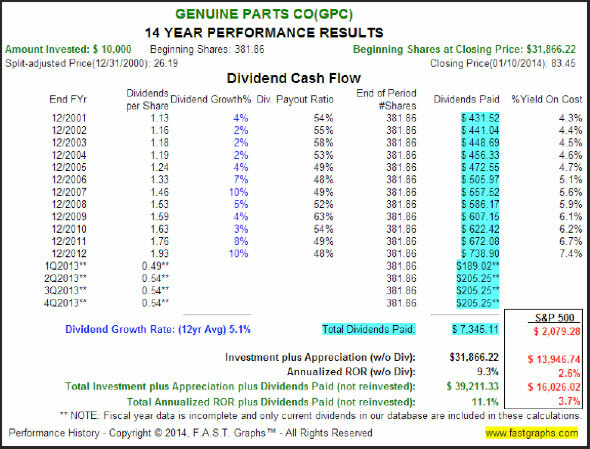 Further, Genuine Parts pays out about 50% of its profits in the form of dividends and has increased this payout by a rate of about 6% per year for the last decade. At the same time, the common shares outstanding have been decreasing by about 1% per annum as well. Thus with these strong operating statistics, it's no surprise that TheStreet.com's Jim Cramer had this to say about the company recently on Mad Money: "It is a very good, consistent player." I would largely agree with Cramer that the company has proven itself to be a very consistent and rewarding company. Yet, I think it's useful to observe this view in the lens of current valuation and history while simultaneously turning an eye towards the future. For this I use the Fundamentals Analyzer Software Tool of F.A.S.T. Graphs. Below I have included a 15-year Earnings and Price Correlated Graph representing the price and operating history of the company. We can see that operating earnings (orange line) have grown by 5.6% per year while the dividend (pink line) has grown from $1.08 to an expected payout of $2.33. Further, notice that the normal P/E (blue line) has been 16 while the current price-to-earnings ratio is 19.2. Taken collectively, one can see the company has been a very strong company and the price is presently trading a bit higher than it has historically. Yet, this observation alone does not preclude a company from providing solid performance results moving forward. For instance, at the beginning of 2005 Genuine Parts was trading at a price-to-earnings ratio around 19.5 -- not unlike where it trades presently. In addition, operating earnings grew by about 7.7% a year over this 10-year period. 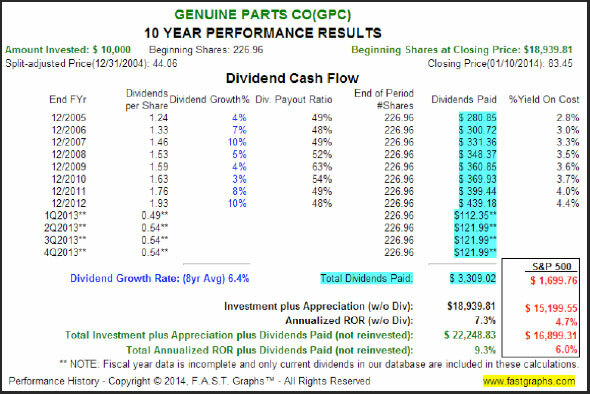 Despite trading at a bit of a premium in 2005, Genuine Parts still returned over 9% a year for patient shareholders. A hypothetical $10,000 investment on 12/31/2004 -- when shares were trading at about 19.5 times earnings -- would have turned into just over $22,000 today, including dividends received. Given that the company traded at over 19 times earnings and grew operating earnings at under 8% a year, this is quite notable. However, purchasing a security at a lower valuation can yield even more impressive results. For instance, at the beginning of 2001 Genuine Parts was trading at roughly 12 times earnings. From 2001 until today, operating earnings grew by just 5.7% a year, slower than the previous example. Yet, look what happens to relative price performance. Despite the company not performing as well, an investor would have received annual returns in excess of 11%. It's clear that the valuation one pays is instrumental in determining one's performance outcome. Even when the company grew at a slower rate, Genuine Parts shareholders had higher returns due to the lower valuation. Thus moving forward it would be prudent to consider both ideas in tandem. That is, at today's valuation it's not as if Genuine Parts' shareholders are facing a sure short-term price decline. 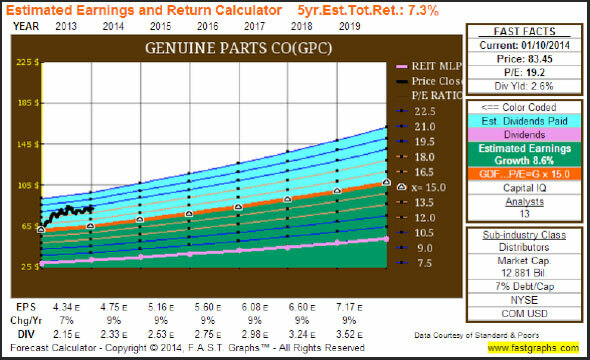 To the contrary, Genuine Parts has previously provided solid returns at these levels. However, the current P/E ratio is much higher than what it has historically been in the last couple of decades. To get an idea of what this might look like going forward, I have included the Estimated Earnings and Return Calculator below. Here we see that 13 analysts reporting to Standard & Poor's come to a consensus estimated earnings growth rate of 8.6%. If these forecasts materialize and Genuine Parts is trading at 15 times earnings, in 6 years this would indicate a 7.3% yearly return including dividends. Note that this is below the expected earnings growth rate. In order for Genuine Parts shareholders to achieve performance results that mirror business results, one would likely have to expect the market to pay a similar multiple as it does today in the future. Surely this is not impossible, but as we have seen, this would be higher than the normal range in which Genuine Parts has previously traded. Now, it's important to underscore the idea that this is simply a calculator. Specifically, it defaults to the consensus earnings growth rate and next two fiscal year estimates to predict a future price. Additionally, it is presumed that the dividend payout ratio will stay the same and thus grow with earnings. A F.A.S.T. Graphs' subscriber has the ability to change these numbers or run their own scenario analysis. However, this does provide a solid baseline for how analysts are presently viewing this company. In sum, I believe that Genuine Parts is an especially consistent company that has proven decade after decade that it can reward shareholders. 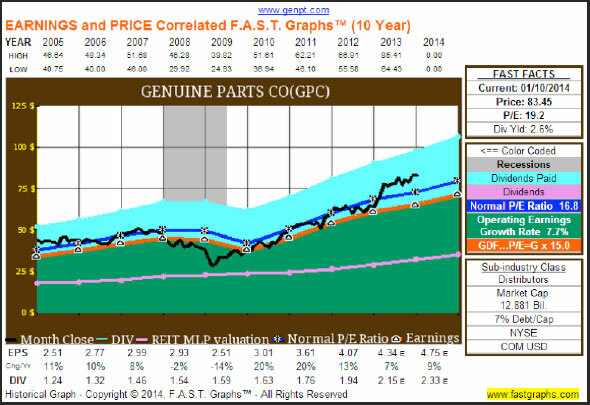 Today Genuine Parts is trading at a valuation that has been higher than what the market has usually been willing to pay. Yet, that alone does not mean that it will be an inherently poor investment -- as demonstrated one can still see positive performance results by partnering with an excellent business for an intermediate timeframe. Personally I would be leery of committing new capital to Genuine Parts at today's levels. However, I recommend that the reader conduct his or her own further thorough due diligence. At the time of publication the author is long GPC.